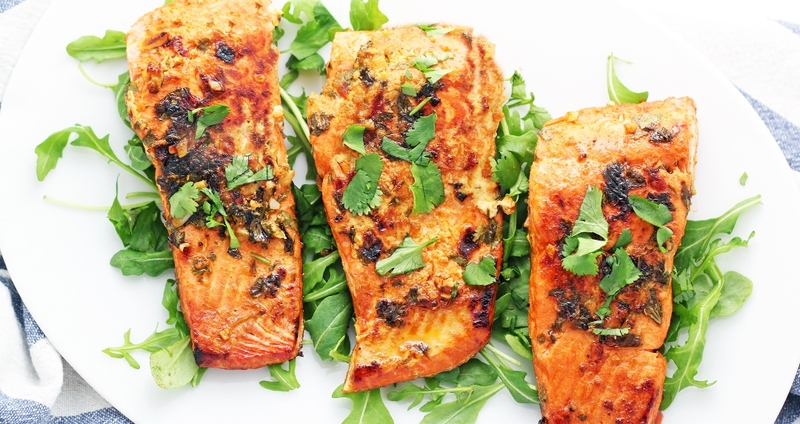 Salmon is one of the top ten foods for an anti-inflammatory diet due to its omega-3 fatty acids. This delicious recipe is a great way to add more salmon to your diet, since it cooks quickly and can be prepared easily on a busy weeknight. Serve this with roasted vegetables or a colorful salad for even more anti-inflammatory benefits. Mix the safflower oil, garlic, chili powder, cumin, salt and honey together. Add the salmon to a dish and top with the sauce. Let marinate in the fridge for about 10 minutes. Add the coconut oil to a large pan over medium-high heat. Rotate the pan to coat the bottom evenly in oil and add the salmon and lime juice, along with any excess marinade from the glass dish. Cook the salmon for about five minutes, then flip. Continue cooking for another five minutes, or until the internal temperature reaches 135 degrees F. Garnish with cilantro or fresh herbs if desired.